At our house, the cleaner we eat, the better we feel. We do spend a little bit more money on food these days, but we have found great sources for saving money on organic, gluten free and healthy food. 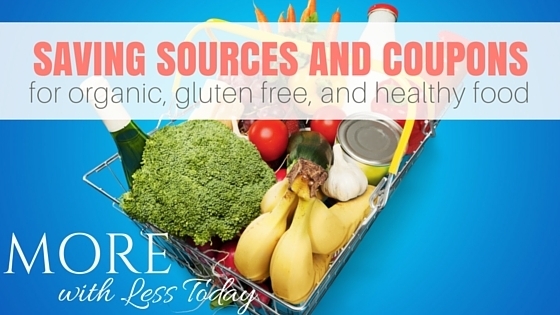 Are you shopping for organic food, gluten-free, and healthy food? We update this awesome list of coupons and sources every week for our readers. Please share it with others who want to save money too. Blue Diamond – not just nuts, there are coupons for Almond Breeze products too with email sign up. Dreamfields Pasta – sign up for their newsletter and get $1.00 off coupon. You will get a monthly newsletter with recipes. Driscoll’s Rewards Program – sign up and get a 50-cent off welcome coupon on strawberries, raspberries, blueberries, or blackberries, which are sold at major retailers throughout the country. As a Driscoll’s Rewards Club member, you will be eligible for special offers, including a birthday gift. You can also elect to become a member of Driscoll’s Customer Advisory Panel, which provides an opportunity to earn additional product coupons for completing customer surveys. Earthbound Farms – sign up for their newsletter for free stuff, coupons and more. Enjoy Life – company has food, recipes, and support for those with dairy, egg, wheat, and peanut allergies. Fresh Express (the ready-to-eat packaged salads in the produce section of your local grocery store) offer coupons when you subscribe to the company’s newsletter. Look for the sign-up form in the upper right corner of the website. You can also visit Fresh Express’ Salad Swap site to learn how to recreate your favorite recipes using healthier ingredients and access additional product coupons. Health e-Savers – print coupons for popular products such as Annie’s products, Barlean products, Carlson supplements, and Simply Organic seasonings. Horizon Organic Milk – sign up for emails to get coupons for milk and other Horizon products. Ian’s – all natural and organic whole foods. Sign up and request emails. Laura’s Lean Beef – features cattle never given antibiotics or added growth hormones. Sign up for monthly newsletters and get a coupon for $1.00 off. Lifeway Kefir – Sign up for newsletters and get coupons. Organic, Stonyfield, Organic Valley, Helios, and So Delicious products. Organic Valley -view and print coupons from their website. Pacific Natural Foods – sign up for their email list and you can print all current offers. SeventhGeneration – sign up for their newsletter to get coupons and special offers. Simply Organic – print coupons for baking mixes, spices, extracts, dips, marinades and more. StonyfieldOrganic – sign up for emails and get coupons for YoBaby and Oikos products. Whole FoodsMarket has printable coupons on their site. Did you know that Trader Joe’s will accept coupons for the products that they carry? Trader Joe’s does not have an official coupon policy on their website, however, my local store accepts manufacturer’s coupons for the organic products that Trader Joe’s carries. 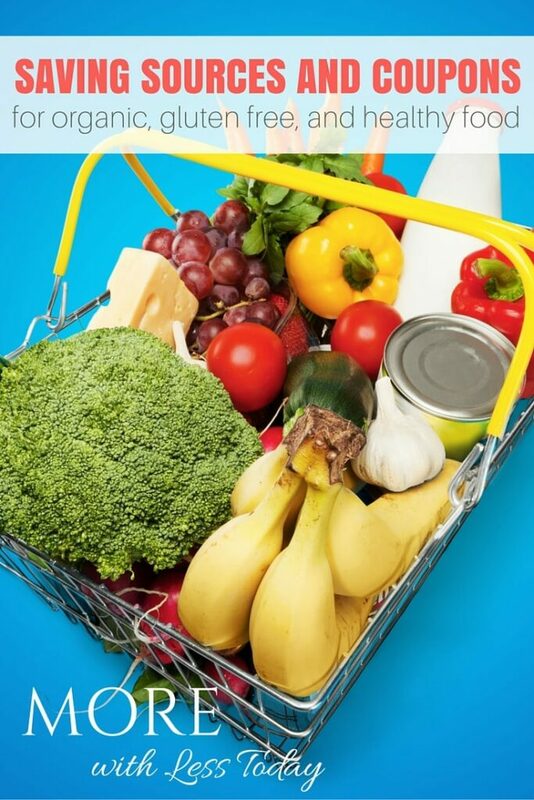 Have you heard of this money-saving APP for grocery store savings on organic food called BerryCart ?. If you are familiar with Ibotta and Checkout 51, then you can just jump on board and get started right away. BerryCart will save you money, in any store, on natural, organic, gluten-free, non-GMO, and allergy free food and drink. Purchase your items, and then take a picture of your receipt, and BerryCart will send you a money back rebate which you can cash out through Paypal or by getting gift cards. You can find products offered in BerryCart in over 25,000 locations including Whole Foods, Sprouts, Walmart, Target, and Mother’s Market just to name a few. Sign up for BerryCart right here, and get PayPal money for the healthy foods you are already purchasing! A pretty cool way to earn some extra cash! *More With Less Today tips: -Learn the coupon policy at your local supermarket. Many of these manufacturers coupons and competitors coupons, like the Whole Foods coupons may be accepted at your local supermarket for the organic products that they carry. Learn the coupon policy at your local supermarket. Many of these manufacturers coupons and competitors coupons, like the Whole Foods coupons may be accepted at your local supermarket for the organic products that they carry. Use a secondary email address to sign up for coupons and offers. I don’t want your email inbox to look like mine does! You can get a free email address from Google or Yahoo. We have a FREE GROCERY COUPON DATABASE you can use to find all the grocery coupon and drug store coupons you need. Simply type the name of the product or brand you like into the search bar, and all available coupons will be displayed. If you have embraced healthier eating too, we would love to hear your tips! Don’t forget to share this resource with your friends and family. Bookmark this page so you can refer back to it!